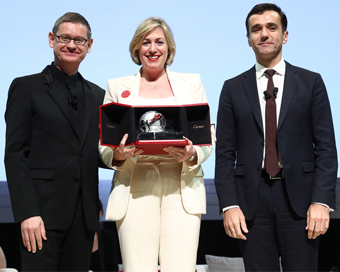 Cartier has announced Irish Entrepreneur Ciara Donlon, as the 2017 Cartier Women’s Initiative Awards laureate for Europe. Ciara received her award at the programme’s annual Award ceremony on April 12th, held in Singapore for the very first time. Ciara Donlon’s THEYA Healthcare offers post surgery undergarments for women, made of an innovative bamboo mix fabric that is more absorbent and more resistant to bacteria than 100% cotton. Cyrille Vigneron and Ilian Mihov announced six laureates selected by an independent international jury amongst nearly 1900 applicants from over 120 countries. In addition to receiving a year of personalised mentoring, valuable media visibility and expanding networking opportunities, each 2017 laureate will be granted a place on an INSEAD Executive Program (ISEP). This year, the prize money awarded to each laureate’s business has been increased five-fold from US$20,000 to US$100,000 in recognition of their contribution to finding innovative solutions for a sustainable future.